The other day I was leaving Shop Rite, and yep you guessed it... I left with a pack from the vending machine. 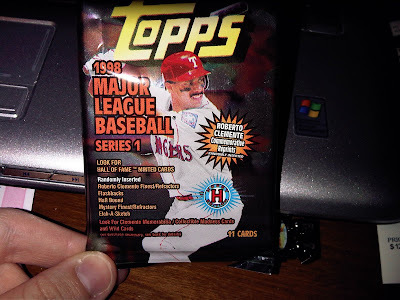 Poison of choice was a pack of 1998 Topps Series 1 Hobby pack. I took a picture of the wrapper so everyone could have a good chuckle of it like I did when I saw it. I got only 2 decent cards in the pack and the rest of the cards were draft picks that never were, and scrubs. I got a Tony Gwynn and Vlad Guerrero. It was a fun blast from the past for a change of pace. Anyone else open something old and get something cool lately? I'll be back a little later, got no sleep last night between this stupid cold and Step Brothers was on again, so of course I watched it. Last test is tomorrow and then I will have completed 12 credits in 10 weeks which I know know is quite possible, yet brutal. Fantastic. 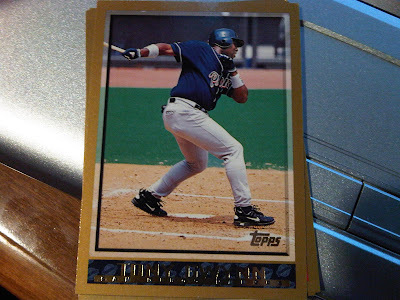 98 Topps is actually a set I'm trying to complete out of nostalgia from my college days. For whatever reason, those ugly patterns behind the player names call out to me. 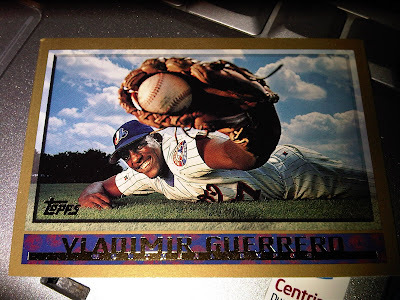 Its quite a terrible design and I'm pretty sure I don't really like "the gold years" from Topps, but I must finish that set! I love that Vlad card. It's the one card I knew I was looking for when I went back through 11 years later. That Vlad card is awesome. I don't collect Vlad but I did keep this one. I miss those Expos unis too.